The site for buddhistic culture, history, schools, temples, karma, meditation and many more topics for your religious studies. The Avataṃsaka Sūtra (Chinese 華嚴經; pinyin hua yan jing) is one of the most influential scriptures in East Asian Buddhism. The title is rendered in English as Flower Garland Sutra, Flower Adornment Sutra, or Flower Ornament Scripture. This text describes a cosmos of infinite realms upon realms, mutually containing each other. The vision expressed in this work was the foundation for the creation of the Huayan school of Chinese Buddhism, which was characterized by a philosophy of interpenetration. Hua-yen is known as Kegon in Japan. The sutra is also well known for its detailed description of the course of the bodhisattva‘s practice through fifty-two stages. 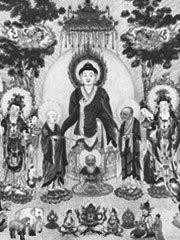 Three full Chinese translations of the Avatamsaka Sutra were made. Fragmentary translation probably began in the second century CE, and the famous Ten Stages Sutra (十地經), often treated as an individual scripture, was first translated in the third century. The first complete Chinese version was completed by Buddhabhadra around 420, the second by Śikṣānanda around 699, and the third by Prajñā around 798. The last chapter of the Avatamsaka also circulates as a separate text known as the Gandavyuha Sutra.